Objective: This paper presents the effect of anode temperature and contact voltage on the breakdown arc of micro electrical contact pair under DC excitation. Methods: A rectangular micro electrical contact pair is considered. The resistance and capacitance of the contact pair are obtained for the materials Al, Cu, Au and Pt. 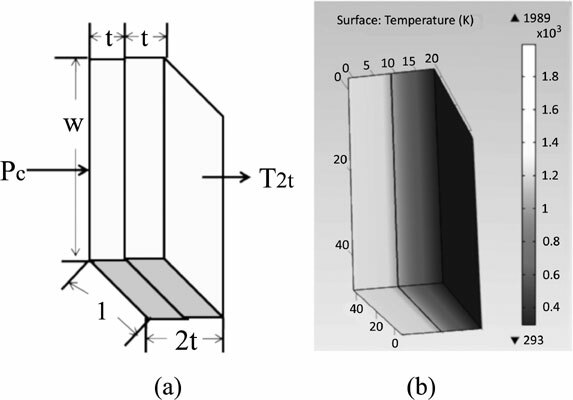 The anode temperature is calculated based on the 3D heat equation. Pre-breakdown arc due to anode temperature is analyzed. Result: The breakdown voltage and breakdown electric field characteristics for the gap between 0.5µm and 30µm are reported. The electric field of micro electrical contact pair is analyzed mathematically. The calculated values of resistance, anode temperature and electric field are compared with the simulation results obtained using COMSOL multiphysics FEA software tool. The arc-less operating region of micro contact is identified. Four cases with the ratings 50V/5A, 50V/0.5A, 400 V/ 5A and 400V/0.5A have been considered for the analysis of arcless micro electrical contact. Conclusion: These results can be considered while designing arc-less micro electrical switches, micro relays and micro circuit breakers which can be applicable for the future DC electric power distribution, protection system and automobiles. Also these results can be considered when designing micro actuators, sensors and electrostatic devices. Breakdown arc, anode temperature, electric field, arc, micro electrical contact pair, contact voltage.